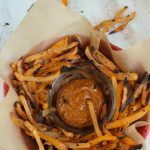 Savory-sweet french fries made from healthy rutabaga. Low calorie, easy to make, and complemented by two delicious dips. Wash and peel rutabagas, then cut into french fry-sized pieces, about 1/4″ by 1/4″. Preheat oven to 425º and line a baking sheet with parchment paper. In a large bowl, toss chopped rutabaga, minced garlic, olive oil, lemon juice, rosemary, salt, and pepper. Mix together using hands under the fries are lightly coated. Bake for 35-40 minutes, removing once or twice to stir fries around on baking sheet. To make the sauces, combine the ingredients for each in a small bowl and mix using a spoon.